Swordless Knight Swordless Knight is the best mobile game.The lovely princess was abducted by an unknown guy to his closely-guarded fortress. Even though you are given a knighthood your sword is at the blacksmith. So, literally your are a Swordless Knight in shining armour, who has to save his beloved one at all costs. 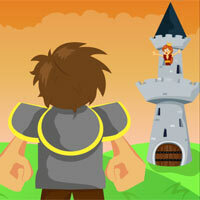 Jump to smash stuff around you, collect gold and dodge all evil in this fun action game.Have much fun.